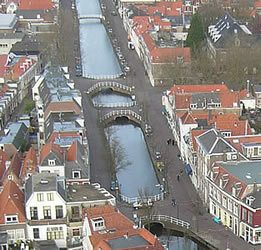 Delft is an attractive town in the South Holland region of the Netherlands. 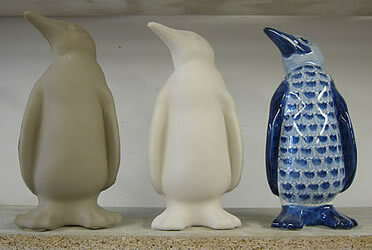 Its population is about 95,000. 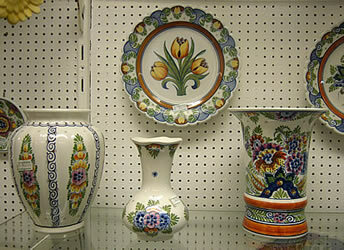 It is particularly famous for its blue "porcelain" tiles and other products, known as Delftware. 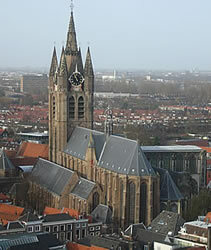 The Nieuwe Kerk ("New Church") was built towards the end of the 14th century. The tower is about 109 metres high. 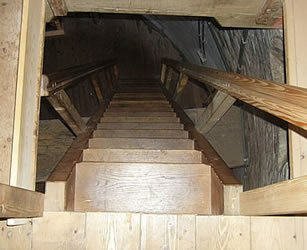 You can climb 376 steps to enjoy lovely views of the town. 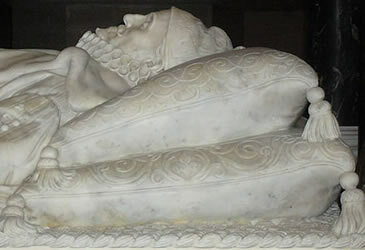 Members of the Dutch royal family (the "House of Orange") are buried here. 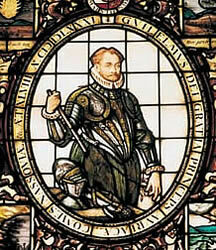 Willem I ("William the First") lived in Delft for much of his life and led resistance against the Spanish . 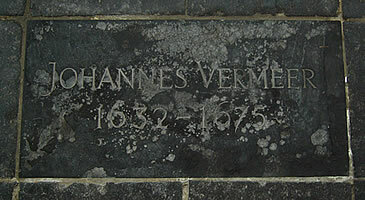 He was assassinated at the nearby Prinsenhof in 1584. 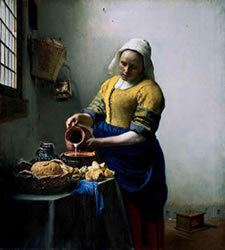 The painter Johannes Vermeer (1632-1675) was born in Delft. 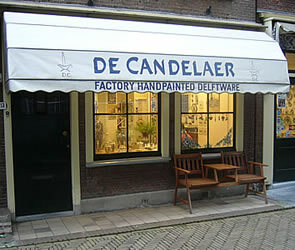 His paintings often show life in the streets or homes of Delft. 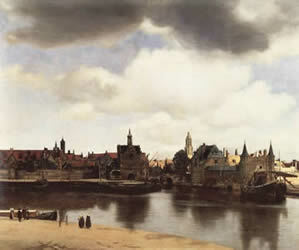 His skillful use of light and colour has made him one the most famous artists of the period known as the Dutch Golden Age (Rembrandt is another famous painter from this time). 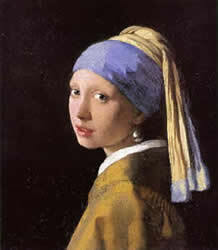 You can see some of Vermeer's paintings in the Rijksmuseum in Amsterdam or in the Mauritshuis in The Hague (Den Haag). 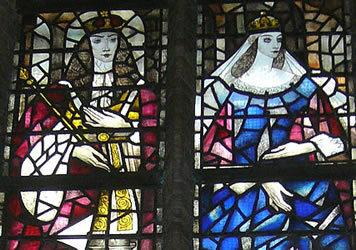 Others are in major international galleries, including a collection in the Metropolitan Museum of Art in New York. "Girl with a pearl ear-ring"
Italian potters brought the art of making tin-glazed tiles to the Low Countries in the early sixteenth century. 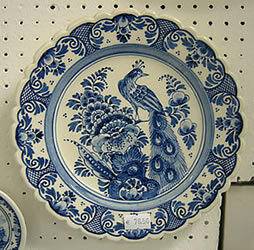 Native potters copied the technique and in the seventeenth century they began to manufacture the distinctive blue and white Dutch tiles. 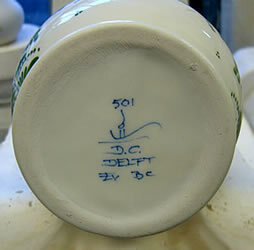 The best tiles and other tin-glazed pottery came from Delft, so the name of the town became associated with this product. 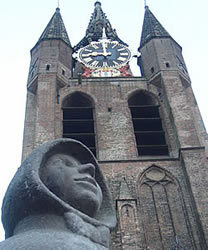 Delft's Oude Kerk ("Old Church") dates from 1246, although there has been a wooden church on the same site for perhaps 200 years before this. The tower is 75 metres high. Historically it has had problems because of subsidence: the tower was nearly removed in 1843 because local people were afriad that the leaning tower would fall down on them. 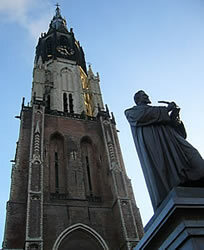 There are two bells in the tower, made in 1570 and 1719. 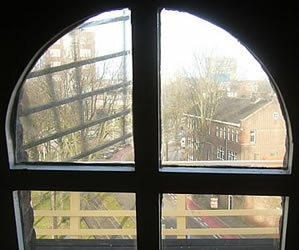 The older one weighs nearly 9 tonnes (the perimeter is 7 metres) - this is only rung on special occasions such as the death of a member of the Dutch royal family, because it is feared that the heavy vibrations could damage the building. Two bells hang in the tower. 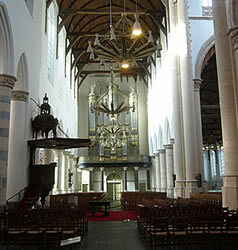 Organ concerts are regularly held here. 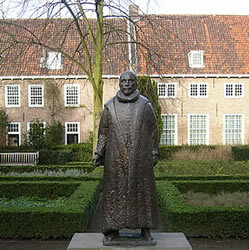 The Museum Het Prinsenhof is located in the former residence of William of Orange, the founder of the Dutch nation. 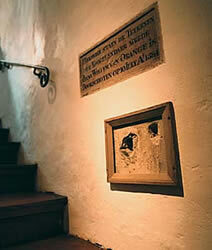 On 10 July 1584, after leaving the dining room, he was assassinated on the stairs. 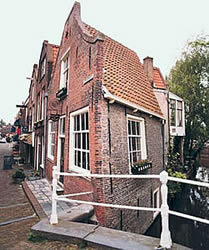 Originally there were 15 windmills within the old defensive walls of Delft, but only one survives today. 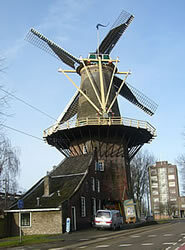 This is called Molen De Roos ("The Rose Windmill"). 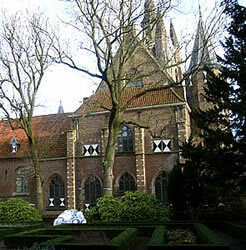 It is located a short walk from the Oude Kerk ("Old Church"). 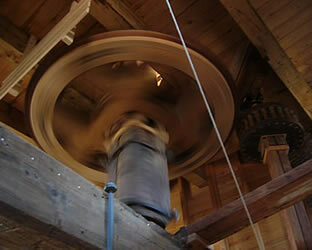 It was used for grinding grain for bakers and barley, oats and corn for farmers. 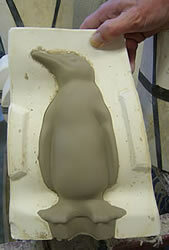 It needed extensive restoration work between 1988 and 1990, but is now back in full working order. When it is open to visitors a blue flag flies from the top of the windmill. There is no entrance charge, but voluntary donations help the Vereniging De Hollandsche Molen ("The Dutch Windmill Association") to maintain the building. 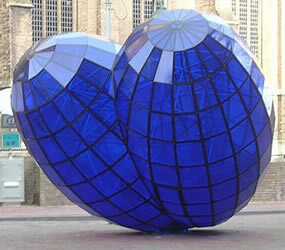 To travel independently to Delft, take the train from The Hague (10 minutes), Rotterdam (10 minutes) or Amsterdam (1 hour). You can also take tram 1 from The Hague (Den Haag) central station: this journey lasts about 30 minutes.